Synopsis: An account of the story of high wire artist Philippe Petit and his incredible and very dangerous mission to hang a high wire between the two towers of the World Trade Centre, and walk on it. Review: For many people, images of the old Twin Towers of the World Trade Centre will sadly be forever associated with the terrible events of September 11th 2001. And while the images of the atrocities of that day may never be vanquished from people’s minds, one must not forget that the buildings, whilst still under construction were at the centre of what has since been called “the artistic crime of the century,” when an insane French high wire artist strung a wire between the two buildings and walked on it, a distance of a whole 1,387 feet between man and a terrifying fall to the ground below. The subject of this daring and somewhat mad story has already been the subject of James Marsh’s Oscar winning documentary Man on Wire. When asked why the awful events of 9/11 are not mentioned in his documentary Marsh said that the act by Petit was: “incredibly beautiful” and that it “would be unfair and wrong to infect his story with any mention, discussion or imagery of the Towers being destroyed.” With this film it is clear Zemeckis is going for a similar effect, it is almost a love letter to the buildings, to remember the Towers for what they were, and of course to retell the tale of Petit’s stunning feat. The big selling point of Zemeckis’s tale however, is to put the audience on that wire, to put you in his shoes when he took those first steps, and it does this with great effect. The process to get to that point goes back to Petit’s days as a street performer in France,with Petit narrating the story atop the Statue of Liberty, and when he sees a picture of the towers, he has his Eureka! moment and sets about on his mission to walk on a wire between the buildings. Along the way he recruits a number of people, most notably his girlfriend Annie (Charlotte Le Bon) and Papa Rudy (Ben Kingsley), the latter of whom helps him hone his craft as high wire artist. The pace of this first half of the movie is somewhat slow and overly long at times, but the interest is not lost. It is when we arrive in the Big Apple that the real planning begins, and the film turns into an exciting heist film, although nothing gets taken, except quite possibly the audience’s breath. The towers have been beautifully recreated by Zemeckis and his team, and when the mission to string the wire between the buildings is being carried out, it carries a lot of suspense with it, as the mission could have easily been over before it began. Joseph Gordon Levitt certainly brings his usual charisma and charm to the role of Petit, except if you’re a man who has a mission to walk between two of the tallest buildings in the world, you’re going to have something of an ego, and unfortunately he does carry this ego, and at times, he can be an extremely obnoxious t**t, even when talking to his girlfriend who is doing everything she can to help him carry out his dream, and also to his team of assembled contributors. For the most part, JGL has the French accent on point, but there are times when it falters a little bit. Nevertheless, the story remains engaging and when we get to the act itself, it is truly majestic, incredible to behold and incredibly suspenseful although for the viewer who has a fear of heights, it might make it uncomfortable viewing. With the most subtle of gestures it is clear that the film and filmmakers pay great respect to those who lost their lives during horrific events of 9/11, and indeed the film was dedicated to those who died that day. With that in mind, the film serves a reminder to the watching viewer, as the tagline reminds us” every dream begins with a single step,” and your dreams are obtainable also, even if they are as wacky and downright dangerous as Petit’s was. 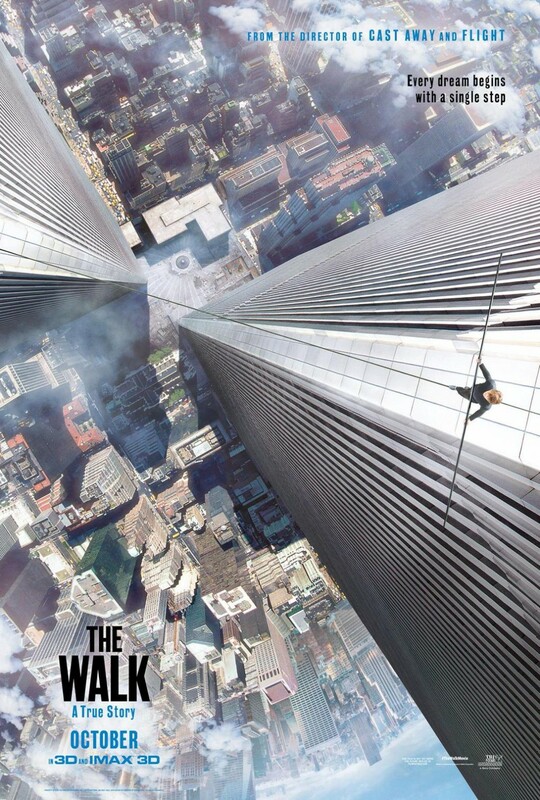 With a somewhat slow opening, a film like this could easily dragged down to mediocrity, but JGL’s performance is of a solid standard, and with Zemeckis’s expert direction, the walk itself is truly spectacular to watch, particularly in IMAX 3D.